We’re going to let you in on a little secret: The Easter Bunny is coming to town! 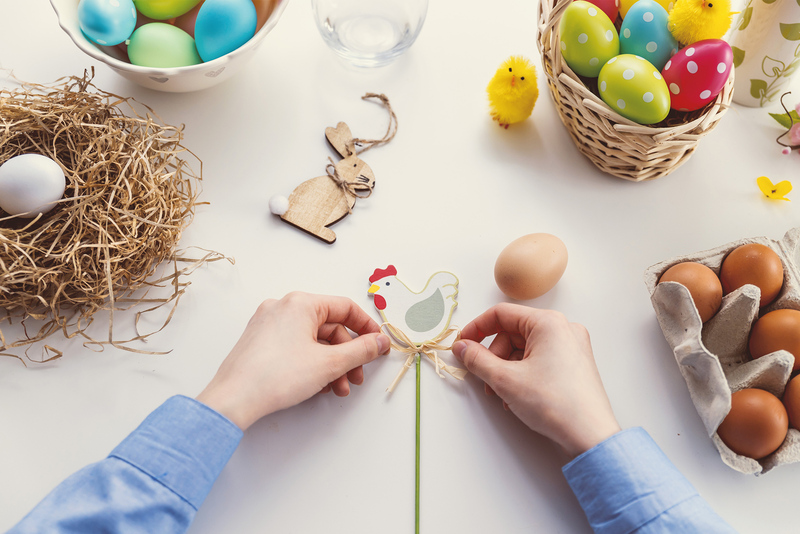 Sure, he might be running a bit late this year — Easter isn’t until April 21 — but it’s never too early to get your home ready, especially for the never-miss-a-holiday decorators among us. There are lots of easy DIY décor ideas that can carry you seamlessly from Easter right into a more generic spring theme, until you’re ready to hang Old Glory (Memorial Day is May 27 this year). This is the quickest path to an Easter-ready home. Create an easy, inexpensive wreath for the front door with nothing but a foam wreath from the craft store, plastic eggs in all your favorite colors, a glue gun and a yard of pastel ribbon. Just keep gluing eggs around the wreath until you can’t see any more foam, then tie on the ribbon and it’s ready to hang! Sneak any leftover eggs inside to nestle among your existing décor and see how long it takes the kids to hunt them down. Or go a bit more sophisticated by adding a sweet little nest filled with a few blue robin eggs inside a simple green wreath. The best part? No need to take it down come April 22 — it’s perfect all spring. Give the bunny a break! For artists: Keep it creative with a new coloring book and a fresh box of crayons or paint. For athletes: Spring is the season for Frisbees and yard games! You can’t go wrong here, as long as there’s something to throw, toss or shoot. For bookworms: Include the book they’ve had their eye on, and add a special bookmark featuring something they love. For little ones, select an Easter board book. For everyone: Bubbles, colorful sidewalk chalk and a new pair of sandals help welcome spring sunshine. Anything but that green grassy stuff that gets EVERYWHERE! Top off your Easter baskets with a plush, fragrant new pal. Scentsy has adorable new Scentsy Friends, Sidekicks and Buddy Clips for kids of all ages. They inspire so much imagination and love, plus they feature kid-safe — and kid-approved! — Scentsy fragrances, like Candy Crave and Strawberry Taffy. So, there are plenty of good-smelling snuggles ahead, too. Reach out to your Consultant or shop their website to get what you need. Don’t have a Consultant? Find one here. Separator image Posted in Authentic Scentsy, Family, Inspiration.